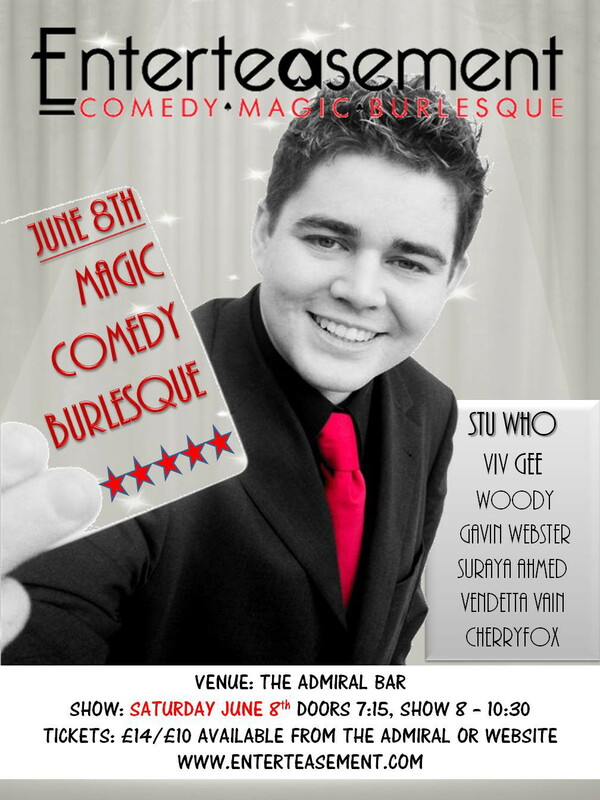 Yip, I’m back on the bill for my Enterteasement show. I’ll be on the bill along with some of the best names in the business. I’ll be trying some new stuff as well including my favourite all time trick. Let me explain. About 7 years ago I saw a trick at a magic convention and I was in awe! It’s not the type of trick that fools a magician; but, I was amazed how much confidence it took to even attempt this trick. Over the years I have told many people about this effect and how it was a total lesson in misdirection and audience management. So when I heard the American magician, who I’d seen perform the trick, was coming to Glasgow to perform a lecture on his act…I knew I would have to learn this trick and put it in my act. So I’ve been practicing it at home which confused the neighbours because I have a mannequin that sits in my front room and sometimes I think they think I’m talking to it and other times I hope the think I’m only talking to it! But I took it out on Saturday night where I was performing at Hootenany’s Bar opening in Glasgow and there were a bunch of Irish Guys so they saw it first and they loved it. I kinda bottled it on my Sunday show and didn’t perform it. But on Monday I was full of confidence and was performing at a Graduation ball and the booker asked to see something that no one else had seen so I did it and he loved it so I’m all happy. It’ll need some polishing off before it’s perfect but I’m all happy it’s coming together. It’s a Comedy Magic Burlesque night at The Admiral Bar in Glasgow. I was already performing on the comedy scene and at some burlesque clubs and made sense for me to run a night bringing all 3 together and it’s been an absolute blast. People often ask me if I’ve ever had a ‘Stand’ act on or a Jongleurs act on the bill. So this month I’m proud to announce that I’ve got The Headline act for Jongleurs as my Headline….and I’ve also got the Headline act for The Stand opening my show. Yip, that might be why we have a 4.6 star average customer review. 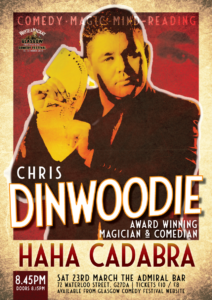 It is simply the best line-up in Scotland of any of the Comedy Clubs.